As Arsenal prepare to take on Manchester United this weekend at The Emirates, the fixture presents a chance for both sides to kickstart their respective assaults on the top four. The fact that it's only a top four place the sides are chasing though is a reflection of how both clubs have slipped away from the title reckoning in recent seasons. With United winning their twentieth league title in 2012/2013, little did they know of the season and half of struggle that lay ahead of them following Sir Alex Ferguson's retirement. As for Arsenal, they have continued to be a good side under Arsene Wenger for the past decade, but they haven't realistically looked like a side capable of winning the league since "The Invincibles" of 2003/2004. Although this weekends encounter is sure to be exciting it simply can't match some of these sides past meetings for its significance. When Arsenal and United met in the late '90s and early '00s, the title or a cup was usually on the line and there was also a genuine animosity between the two sets of players and their respective managers. The matches between these sides in that period bubbled with intensity and often generated moments that were season defining. As champions Manchester United came flying out of the blocks in the 1997/1998 season, Arsenal entered this match at Highbury four points behind and needing a win to stay close to the league leaders. Goals from Nicolas Anelka and Patrick Vieira staked Arsenal to a 2-0 lead before a pair from new signing Teddy Sheringham drew United level. A David Platt goal seven minutes from time though put Arsenal ahead for good. In Arsene Wenger's first full season at the club, Arsenal would be imperious after Christmas and would win 10 matches in a row en route to winning the league title. saved the Dutchman's penalty and sent the match into extra time. 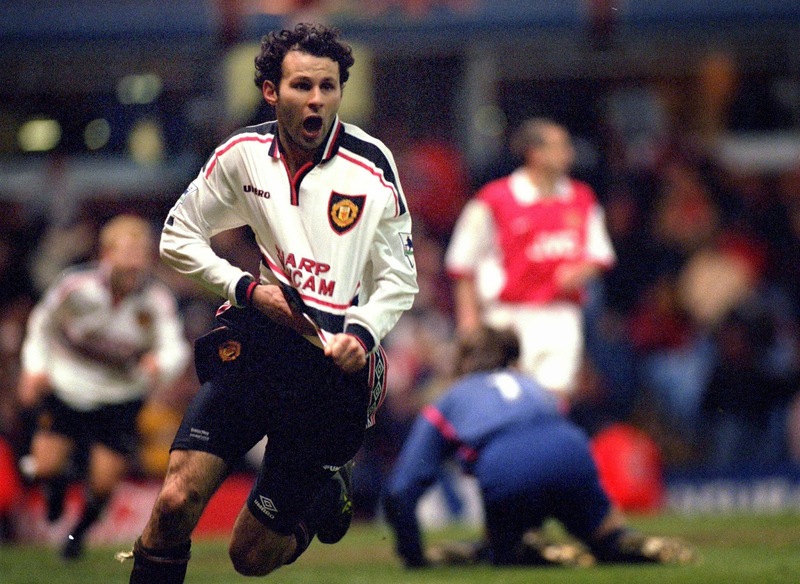 In the 109th minute, with both sides tiring, United substitute Ryan Giggs picked up an errant pass from Patrick Vieira, drove at the Gunners defence and scored a goal for the ages to settle the match. Manchester United would go on to win a historic Premier League, FA Cup, and UEFA Champions League title while Arsenal would finish the season empty handed. In a season where Arsenal went on to finish their league campaign without a loss, it's often forgotten that they were only a cross bar away from losing their unbeaten record in September. 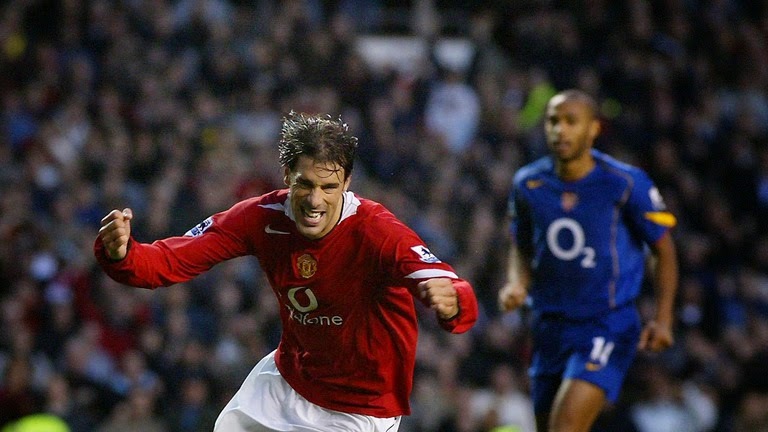 United, having finished the previous season as champions seemed to have this ill tempered affair in hand when Arsenal captain was sent off in the 80th minute for appearing to kick out at Ruud van Nistelrooy. Ten minutes later, the Dutch striker had a chance to win the match for United with virtually the last kick, before seeing his effort from the penalty spot crash off the bar. 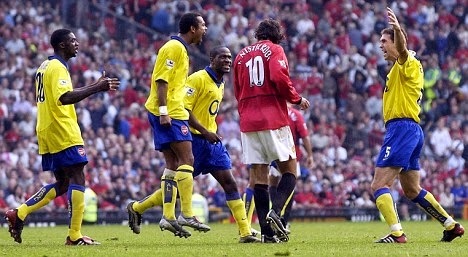 Several of Arsenal's players responded to Van Nistelrooy's miss by confronting the United player and screaming abuse in his face. It was a case of handbags at dawn as the two sets of players fronted up to each other over the incident, but eventually two United and six Arsenal players were charged and fined by the FA for 'improper conduct' over the incident. The Gunners cared little though as this was the closet they'd come to losing all season as they romped to the title. Known forever as "Pizzagate" or "The Battle of the Buffet" this was the match when Arsenal's record breaking unbeaten run of 49 games came to an end. In an often violent, but always engaging affair the two teams traded blows, literally and in a football sense throughout, but the pendulum swung in United's favour when they were awarded a very contentious penalty after Sol Campbell brought down Wayne Rooney in the box in the 72nd minute. Van Nistelrooy cooly exercised any memories from the year before as he put his side ahead from the spot. A reeling Arsenal were then put away by a goal from Rooney in the 90th minute. Following the match tempers boiled over in the tunnel, where pushing and shoving escalated into Cesc Fabregas throwing a slice of pizza at United manager Sir Alex Ferguson, along with other food items being thrown around. The match left Arsenal furious with the performance of referee Mike Riley, as they not only felt aggrieved by the penalty decision but also by some rough tackling by the United players that had gone unpunished. In the return fixture at Highbury later that season, the bad blood boiled to the surface prior to kickoff with United's Roy Keane and Gary Neville involved in a physical altercation with Arsenal's Vieira. Despite United winning that match 4-2 to complete a double in the league over the Gunners, it would be Roman Abramovich's Chelsea who would win the title that season. It was the first Premier League crown since 1995 to not be won by either Arsenal or Manchester United and signaled the end of an era in the rivalry between these clubs in their battle for league supremacy.